It is obvious in Janet Yellen`s brief tenure as Fed Chairperson that she is too dovish to be an objective leader at the Federal Reserve, she isn`t even the most qualified representative on the current configuration of the voting members. Her approach and economic philosophy might be acceptable in a full blown recession where by accident her approach might be appropriate to the economic conditions of a recession. But in a normal economy in the business cycle, and with the Fed sitting on a 4.5 Trillion dollar balance sheet, and bubbles in financial markets everywhere one throws a rock, she is a disaster waiting to happen. It all comes down to this crucial point, and it is the most important point in the entire ‘free money debate’ it is not a question of if markets are in a bubble territory, they are, but by how much? Therefore, the longer policy puts off the rate hike, the faster they will have to be in raising rates, and the more damage that occurs to bubbles, market participants, and the economy when the speed of rate hikes is exponentially faster. Given this fact, it is an economic fact that risks go up also in an exponential manner with the speed of rate rises by the Fed, it makes no sense in fact to still be buying bonds. Furthermore, it makes even more sense to start raising rates at the September Fed Meeting by 25 basis points and continue raising rates in 25 basis point increments at every quarterly Fed Meeting until the 3% Fed Funds Rate level is reached. Take a pause at that level, and see if they need to continue towards 4.5 to 5% based upon how the economy is performing, inflation, and the labor market. However, given what everyone knows that the 10-year bond should not be at 2.4% yield, there are a lot of market participants that need to adjust to the reality of a normalized policy world, and they are so far from this reality due mainly to an incompetently dovish Fed led by Yellen, that the amount of re-pricing that needs to occur, even if they started raising rates today is just off the charts. It is the most crowded, and off-sides trade in the history of financial markets, given the sheer size of the market involved, it in short is a disaster waiting to happen! Janet Yellen is too dovish to signal any policy change in advance for market participants, by the time she does signal it is too late to avoid major market dislocations. This is just not competently managing market expectations; it is unacceptable for anybody in this position! Risk Reward Calculation: Where are the Risks, and on What Magnitude? When one factors the risks versus the rewards of Yellen`s dovish approach to date, one can only come away with the conclusion that she is beyond her depth in this job. It is completely irresponsible to take these risks when weighing stability of the entire financial system versus some mystical labor slack argument that some ‘retired’ workers might want to come back into the labor market if it gets even better. Yeah and I would like to have the same energy I had when I was 16 too, but I am sure not putting my whole life on hold waiting for some magical wonder drug to bring this about! There are risks involved, and they are much more dangerous to long-term economic stability by being so dovish where one basically has their head stuck in the sand, and completely oblivious to more normalized economic conditions, and current monetary policy still being stuck in ‘end of the world’ recession bunker mode. I would personally replace Janet Yellen with James Bullard as he is more balanced than Charles Plosser, however after listening to Plosser at Jackson Hole, I think he is the best person for the job given where the current Fed`s balance sheet is, and the fact that we are entering the necessary tightening phase. He would be best able to manage this tightening phase as his approach is the perfect fit for what monetary policy objectives need to be in matching a normalized economy! Any rational minded and clear thinking individual who listened to his responses and thinking process on the issues at hand regarding monetary policy realizes that he nailed it on every account. 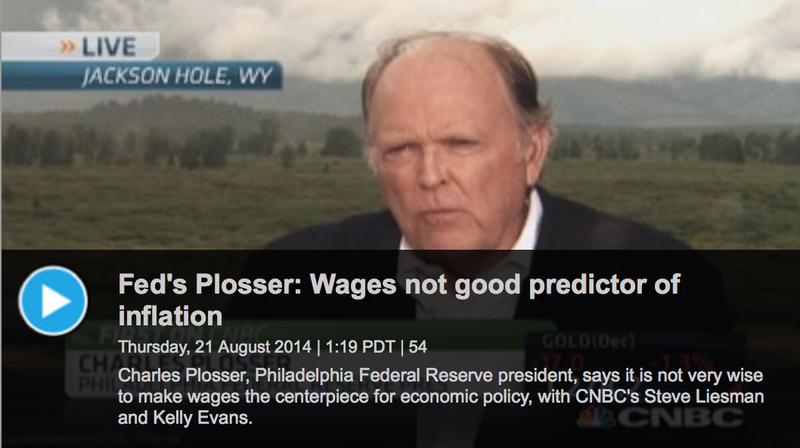 Charles Plosser is spot on with his analysis of where the Fed is, and where they need to be with regard to an adjustment in monetary policy. I realize there are a lot of politics involved in being chosen Fed Chairperson, but apart from those, he is the best person for the job given where the Fed needs to be relative to the normalization phase in the monetary policy cycle.